Cirque du Soleil’s new show, “Luzia,” has arrived in Marymoor Park with its usual complement of dazzling special effects and superb acrobatics, this time saluting the sights and sounds of Mexico. 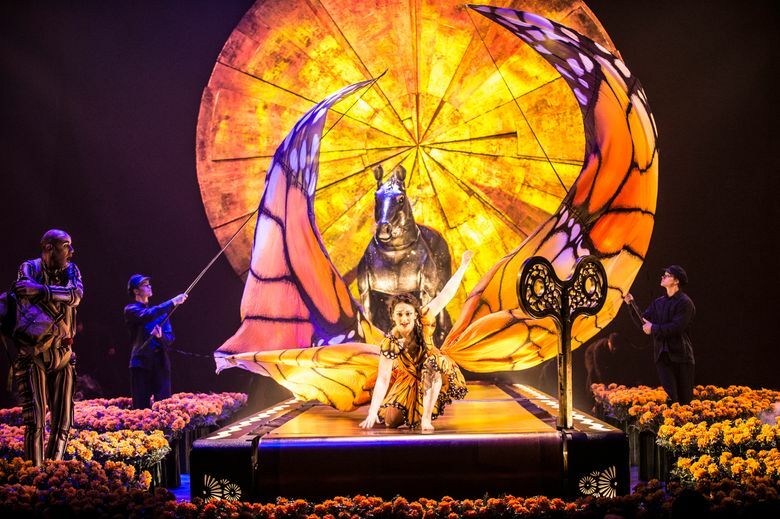 The flora, fauna, birds and beasts of Mexico, along with displays of the human body electric, work the magic in “Luzia,” the latest Cirque du Soleil production to arrive at Redmond’s Marymoor Park. Hats off to director Daniele Finzi Pasca and his top-flight design team for conjuring a voluptuous, ever-changing wonderland of folkloric and wildlife imagery in a spectacle that’s not among the Canadian circus behemoth’s most cohesive or mythic offerings. It does, however, contain the visual delights and stunning acrobatic talent one expects under the company’s Grand Chapiteau, with a cast that includes Latin American artists as well as the usual Cirque complement of performers from around the globe. The title “Luzia” is a hybrid of the Spanish words for light (“luz”) and rain (“illuvia”). 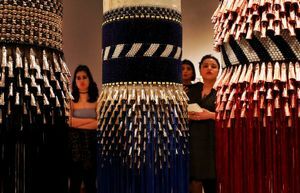 Accordingly, a backdrop of a giant medallion (a common symbol in ancient Aztec and Mayan design) turns rich shades of copper, scarlet, green, and other hues as the show progresses. And there is occasionally a tropical shower, with shimmering curtains of rain draining through thousands of holes on the sievelike stage floor. 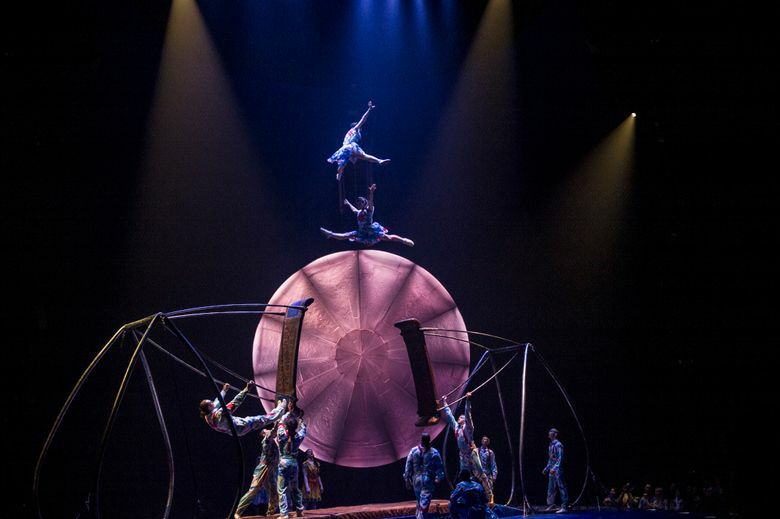 Through May 21, Marymoor Park, Redmond; tickets from $35 (877-924-7783 or cirquedusoleil.com). Enormous stallion and jaguar puppets, acrobats in colorful plumage and performers in full-shell cockroach and armadillo masks roam through the proceedings, sharing the scene with expert hoop-divers, hand-balancers, trapeze artists and (a favorite) an amphibious (human) “demigod” who performs a thrilling aerial straps routine in a pool of water – and often whips back his long, wet locks like a rock star for emphasis. “Luzia” recycles the “stranger in a strange land” motif that frames many a Cirque du Soleil show. The interloper here is a lanky, goofy tourist (played by Dutch jester Eric Fool Koller) who parachutes in from the rafters. Though he drew laughs for “coaching” the crowd with loud blasts of a sports whistle, and tosses of a beach ball, the clowning was disappointingly basic and, well, dumb. More captivating were the sounds of a roaming mariarchi-style band, and a lovely cantante femenina (Mexico’s Majo Cornejo). Unplanned among the acrobatic thrills and chills on opening night was an accident during a risky, dramatic “swing to swing” act. Leaping between two bobsled-shaped, swift-moving swings, a female acrobat landed flat on her back, plunging the opening night audience into hushed, anxious silence as she was tended to and moved offstage during a 10-minute break in the action. The show went on to its fiesta finale. Cirque du Soleil later announced the performer had a “hard landing” but, happily, required no hospitalization and would, in due course, return to the cast. The incident was a reminder that the feats circus artists of this caliber perform are truly daring as well entertaining. Keep that in mind, and they’re all the more extraordinary.